$152.99 JBJ EFU-45 Reactor Canister Filter w/UV, Ships Free! 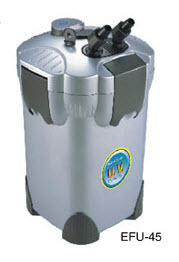 JBJ EFU-45 Reactor Canister Filter w/UV, up to 170 gal. Reaction 4 stage canisters are the latest innovation in high capacity filtration systems. 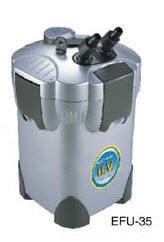 This revolutionary canister filter incorporates high media storing capacity with easy to remove basket trays, self priming lever, quick disconnect shut off valve for convenient media replacement, and an intergraded IV sterilizer with On/Off witch that polishes water to crystal clarity while keeping pathogens at bay. EFU-45 Reaction 4 Stage Canister filters utilize mechanical, chemical, biological, filtration, and IV sterilization for a balanced aquarium. Water enters the canister via the intake strainer and is guided through a large sponge to trap particulate matter. The water then reaches 500G of activated carbon to remove harmful dissolved organic compounds. Water is directed over the ceramic rings that offer a tremendous amount of surface are internally and externally to grow beneficial aerobic bacteria that break down harmful ammonia and nitrate and nitrite. 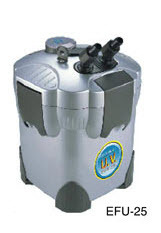 All filtered water then passes through our powerful UV-C lamp for pathogen and green water elimination. JBJ Reaction 4 Stage Canister Filters are equipped with the most advanced features to provide high performance and make routine maintenance quick and easy in your aquarium. Our innovated self priming lever eliminates the need for manual siphoning. Simply, pump the lever up and down vigorously until the water enters the inlet and the remaining air bubbles leave the outlet. Definitely the most useful feature to keep floors dry when carrying out routine monthly maintenance. The Quick Disconnect Shut Off Valve is an integrated tool that instantly creates a watertight seal that stops water from entering or exiting the filter. Simply lift the SHUT OFF VALVE handle to the vertical position to stop water flow. Grab the handle and detach and take the canister filter for convenient media replacement. This revolutionary concept integrates a special UV-C lamp to destroy green water and polish water to crystal clarity. The accessible ON/OFF switch allows for complete user control. The new trend in canister filters is to increase the filter storing capacity for larger amounts of chemical and biological medias. This allows for higher water quality due to more media contact through the initial pass. All filter baskets have convenient handles for removing and loading up all types of media that can be easily customized.